This weekend our Girls Prep Hockey team is hosting their first ever PINK IN THE RINK game and would love your support! Come out and cheer on our girls as we take on Rothesay Netherwood School on SATURDAY, NOVEMBER 3rd at 5:00 pm at the Newport & District arena in Brooklyn, NS! You can donate by supporting our bake sale and chuck a puck, and there will be prizes and more! All proceeds will go to support the Canadian Cancer Foundation. Please wear Pink or Purple if you can to support this great cause! We want every child to find an activity they can pursue with passion. With three seasons of sports and over 20 different sports to choose from, we're pretty sure your child will find a few they will love. 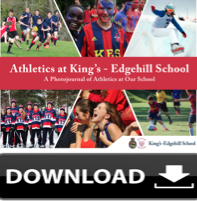 Download our Athletics Photojournal to discover more sports at KES.